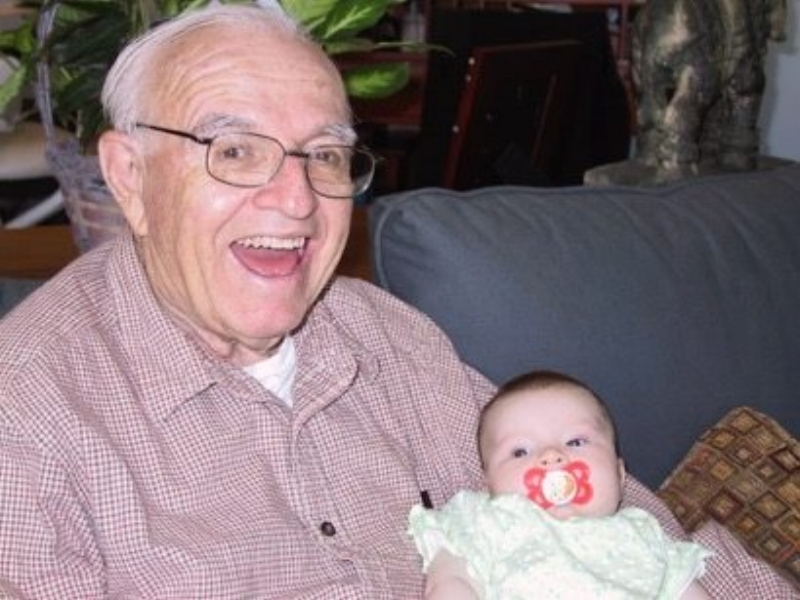 Uncle Dave with my daughter, Marilyn in 2004. "Everyone needs an Uncle Dave" . . . is what my brothers and I would say to one another. A man known for his handsome smile and ability to make friends anywhere, "Dee" as he was affectionately called, was honest and true. From my earliest memories of playing with him when I was four, I recall a distinct mixture of discomfort and joy. The discomfort stemmed from his medicine-induced parkinson that made his hands shake uncontrollably . . . and a form of schizophrenia (schizoid-affective-disorder) that made him talk out loud to himself nearly constantly. Yet, even though he clearly lived in his own mental realm, he was also very present with us as children. The joy I'd feel was from a trust that he would never harm a fly . . . and of course, that he'd let me ride on his back like a horse. The next twenty years brought about considerable changes in the psycho-pharmacuedical market, and his medications became more effective at controlling his shaky hands and his talking to himself. In those years, he also managed to take better care of his health . . . going from a 6-pack of Coca Cola per day to drinking iced tea. He enjoyed good food too, and made lunch out at a restaurant part of his daily routine. The waitresses adored him and the fellow diners enjoyed his occasional stories of bear sightings in CO, or hosting hunters each fall in the "Old Library". Fortunately, his outings were made possible by his means of transportation . . . his feet. He walked everywhere. And his mental and physical health were the better for it. It was not uncommon for him to return from a vigorous walk to tell us "I'm as happy as a monkey with a new ball!" Yet, at times when his balance was poor and he couldn't walk as far or as often, his health suffered . . . and his mood would drop. As it worked for him . . . it is no less so for us. Making movement, walking, running, weight lifting, exercise part of your routine . . . will keep your mood elevated and your blood pressure down. "Everyone needs an Uncle Dave" . . . because he taught patience, compassion, generosity, living in the moment, trust, joy, and love. And he taught us that the simple act of walking invited health, relationships, healthy moods, and joy. Don't take your physical or mental health for granted. Get moving . . . today.